Yipee! 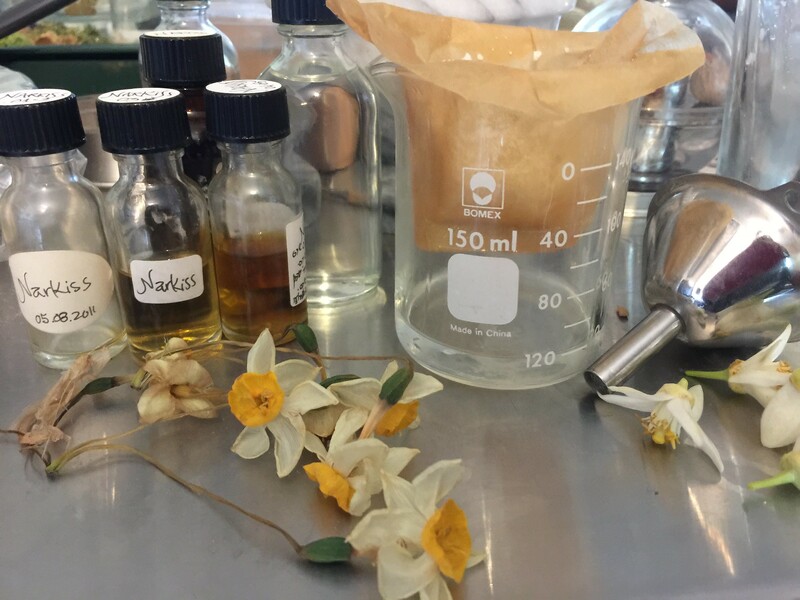 Lucky for me, despite the low numbers of blooming narcissus bulbs in my garden this year, the resultant enfleurage from my meagre one-charge-batch is highly fragrant and gorgeous! If you can imagine me doing a happy dance, this is exactly my reaction to this surprising success. It takes a long time to grow, pick and enfleurage the flowers. And then the fat needs to be soaked in alcohol and left to macerate for several weeks. Today I've finally strained it. The result is a filtered extrait (the term for the enfleurage fragrant tincture, before removal of the alcohol to produce an absolute - a stage I decided to forego due to my low yield and technical limitation), which I promptly added to Narkiss perfume, adding another layer of authentic narcissus to the absolute from Narcisse de Montainges from France that is already in there.